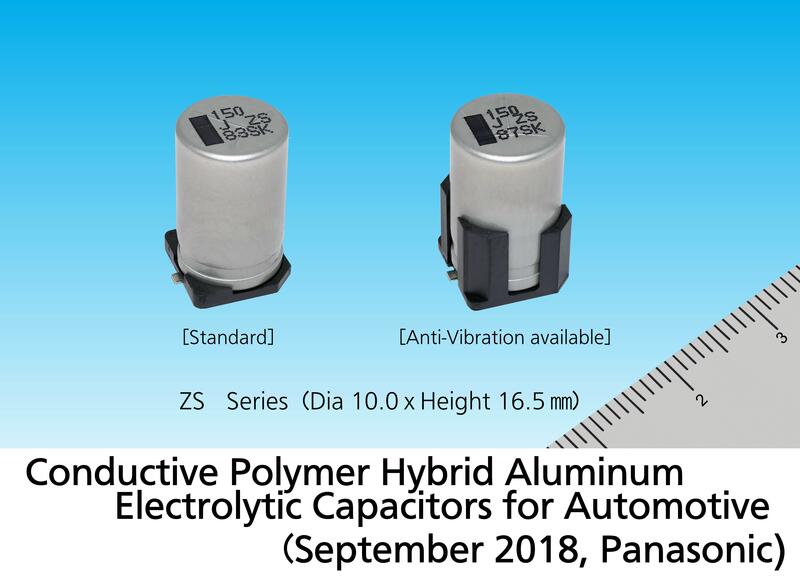 Osaka, Japan - Panasonic Corporation has commercialized the ZS Series Conductive Polymer Hybrid Aluminum Electrolytic Capacitors, which is optimal for hybrid electric vehicles (HVs) and electric vehicles (EVs) that are undergoing increasing electrification by motor drive. The company will launch the series in September 2018. These new products have achieved a large current and large capacity with a diameter of 10 mm and height of 16.5 mm, which is a first for the industry (*1). They will contribute to the miniaturization and weight reduction of automotive electronic control units (ECUs). With the growing demand for eco-friendly cars, energy efficiency, and the need to comply with environmental regulations, vehicles are rapidly shifting from gasoline-powered to hybrid electric and electric vehicles. Now, more vehicles are using drive systems consisting of a gasoline engine with motor assistance (48 V system , etc. ), and the integration of mechanical and electrical components , which involves switching from mechanical to motor drive and electronic control, is underway. These changes have increased the need for the miniaturization and weight reduction of ECUs and stabilization measures for power supply circuits in response to increases in current values. Capacitors mounted in power supply circuits are now increasingly required to correspond to a large current and capacity. To respond to these requirements, Panasonic has commercialized the surface-mounted ZS Series Conductive Polymer Hybrid Aluminum Electrolytic Capacitors. Excellent vibration resistance eliminates the need for anti-vibration reinforcement during mounting processes, allowing customers to streamline their production processes. Contribute to ECU miniaturization and weight reduction by achieving a larger current. It was difficult for conventional products, with a maximum size of 10 mm in diameter and 10.2 mm in height, to correspond to a larger current of 100 to 200 A. By adopting a unique new structure and a polymer impregnation method, the new products, with a size of 10 mm in diameter and 16.5 mm in height, lower the capacitor's internal resistance value, achieving a current 2.5 times larger than conventional products. This will contribute to ECU miniaturization and weight reduction. Contribute to ECU miniaturization and weight reduction by achieving a larger capacity. The new products have achieved a capacity 1.8 times larger than conventional products by increasing the Aluminum foil area through the adoption of a unique Aluminum foil material technology and a new structure design. This will decrease the quantity of capacitors used and required board space, contributing to ECU miniaturization and weight reduction. Excellent vibration resistance eliminates the need for anti-vibration reinforcement during mounting processes, allowing customers to streamline their production processes. The conventional ECU board mounting process requires anti-vibration measures, such as anchoring components with adhesives, to make the ECU resistant to vibration if using non-vibration-resistant components. The developed capacitors have achieved anti-vibration performance high enough to withstand a vibration acceleration of 30 G, making such anti-vibration measures unnecessary, thus allowing customers to streamline their production processes. Integrated starter generator (ISG), electric power steering (EPS), oil pump ECU, water pump ECU, transmission ECU, radiator fan control (RFC), etc. System with a 48 V automotive power supply that significantly contributes to achieving low-fuel consumption during cruising by enabling the miniaturization and weight reduction of mounted lithium ion batteries and drive motors. This system is mounted on mild hybrid electric vehicles. This refers to the integration of mechanical drive components and the ECU. Mechanical drive components and the ECU used to be physically separated and interconnected via cables, but demand for high-precision control, more freedom in component layout, fewer cables, etc., has now led to the adoption of an integrated configuration of mechanical and electrical components.